You may have an app with fields including information that you don't want Quick Base to include in certain search operations. For example, say you'd like to know when a record's been created, but that information means little to your app users. To solve a problem like this and to speed searches, a user with administration privileges can set which fields are included or excluded in Quick Base searches. In each of these areas, you can tell Quick Base you want to find any field with data matching the criteria you specify. In Find, for instance, you simply type in a phrase you want to find. Quick Base automatically searches all fields for your search phrase. Because you may want to speed your searches by excluding certain fields from searches, Quick Base provides a Searchable property to set that behavior for each field. 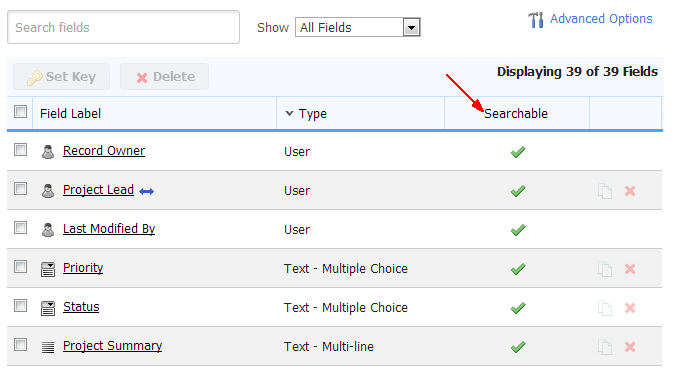 This property is enabled or disabled by default depending on the field type, however, you can disable this property for any field so that Quick Base skips over these fields when performing searches that use <Some field> as the search criteria. Set the Searchable property for several fields at one time by selecting the checkmarks on the field list page. Note: If you don’t see the Searchable column for your app, choose Advanced Options, then select to show the Searchable column. What happens when I search for a particular field? Even if you've turned off the Searchable property for a particular field, you can still search that field. Whenever you specify a particular field in a search (instead of using <Some field>), Quick Base searches that field even if you've turned off the property for that field. From the table containing the field you want to exclude, click SETTINGS in the Page bar, then click Fields. If the Searchable column does not appear in the Fields list, click the Advanced Options link, select Searchable, and click Save. Clear the checkmark in the Searchable column for any field you do not want to include in search.